If you were to ask me to name my favourite chefs, I wouldn’t have to spend too long thinking of an answer: Jamie Oliver (I’m slowly becoming a convert, though more for the food style than the man himself) and Sydney’s own Bill Granger would definitely head my list – and it wouldn’t extend much further. Both chefs have a common bond – simple recipes using great combinations of ingredients, with fresh flavours and clever use of readily available ingredients. This is always the secret to success in cooking – keep it simple, and fresh. I think the following recipes will appeal to people who have this in mind whether cooking for themselves, or entertaining. The featured citrus fruit dessert is almost fat free (0.4g fat), and is a taste treat for the tongue with its subtle ginger flavour. Add Chinese mushrooms to other vegetables. Wash wild rice and strain in a colander. In a small pot, add rice and water, bring to a boil, add salt and turn down the heat to very low, placing a lid over the top. Cook for 40 minutes, then turn off the heat and allow to sit. In a heavy skillet or wok, heat 1 tablespoon of the oil. 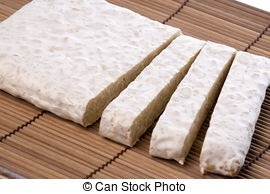 Cut tempeh into very thin slivers and when the oil is hot, toss the tempeh in and cook until crisp. Drizzle some of the sauce over the tempeh as it will absorb the flavour. Set aside. Wash the wok and repeat the procedure with the rest of the vegetables, adding them in this order: onion, red and green capsicum, mushrooms, green beans, bok choy and spring onions. Allow a minute or so between each vegetable, stirring constantly before adding the next one. Add the rest of the sauce, and toss the vegetables to absorb the flavour. Combine wild rice, tempeh and vegetables. 1-2 teaspoon finely grated fresh ginger. Peel and segment mandarins, removing as much pith as possible. Using a sharp knife, peel grapefruit, oranges and tangelos, removing skin and pith. Segment fruit between membranes over a bowl, reserving juice. Place fruit segments into bowl. Sprinkle fruit with sugar and ginger. Gently toss to combine. Cover and refrigerate until chilled. Spoon into glasses, and pour reserved juice over. Serve.